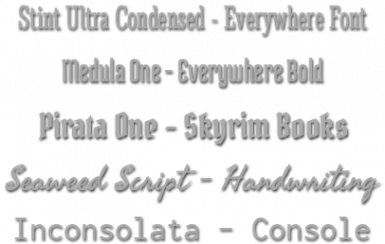 A complete font makeover for Skyrim, featuring Stint Ultra Condensed, Medula One, Pirata One, Seaweed Script, and Inconsolata. All fonts are licensed under the SIL Open Font License. Full text for the license is included in download under the /docs/ directory. 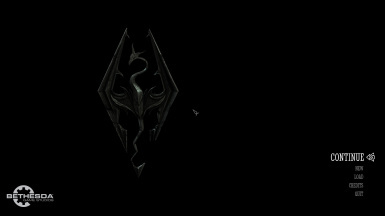 Otherwise, you are free to do whatever you want with this mod, so long as the readme is left intact. morry16, who first gave me the idea of using Stint Ultra Condensed for the Everywhere font. 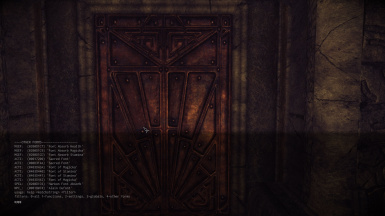 Fhaarkas, whose brilliant Skyrim Interface Mod included a heavily commented fontconfig.txt which helped me out a lot, and which I've unabashedly stolen and improved on. 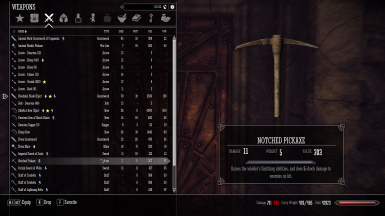 swfmill, for the tool that I used to create this mod. 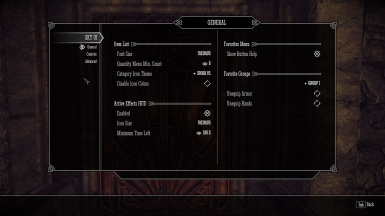 This is a simple mod to change all the fonts used in the game. Stint Ultra Condensed was chosen because it was both a serif font (which I think fits into a fantasy setting better than the sans-serif Futura) and because it's character width was similar to the very narrow Futura Condensed around which all the game's menus are designed. 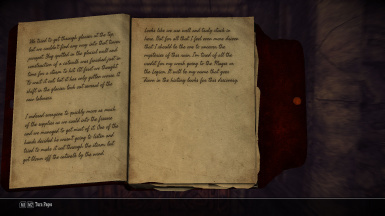 This means the font works well without clipping in the menus. I initially tried using Stint Ultra Expanded for the Everywhere Bold font, but it caused clipping issues. Medula One works better because it has a heavier weight while maintaining a narrow character width. It's enough to bring attention to the bolded information (usually item stats, but also the values in MCM menus) without breaking the flow. Pirata One was selected for the book font because of it's similarity to early printing press typefaces while maintaining legibility for modern readers. Seaweed Script was similar chosen for the handwriting due to it's largely generic style (except the capital S) while maintaining legibility. 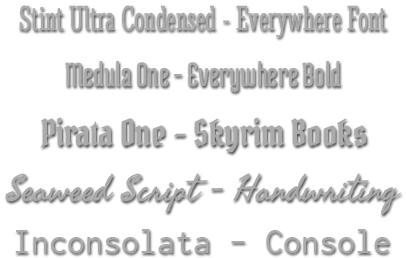 Finally, I wanted a fixed-width font for the console, and Inconsolata is one of my favorite. 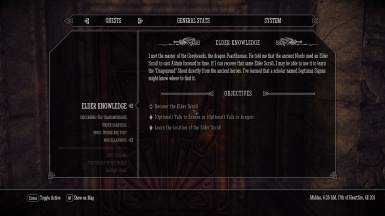 Simply extract the /interface/ folder into your Skyrim/data/ directory. If doing a manual installation, be sure to backup your /interface/fontconfig.txt file (if any) in case you want to uninstall. I highly recommend using a mod manager like Mod Organizer or Nexus Mod Manager to make installation and uninstallation easier. To uninstall just delete /interface/fonts_a7.swf and restore (or delete) the fontconfig.txt file. If you wish to mix and match these fonts with others you'll have to manually edit the fontconfig.txt file. The included file is heavily commented to help you out. 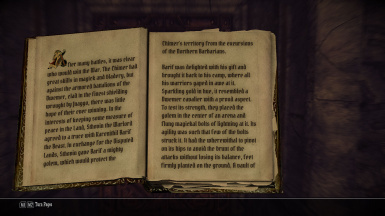 Otherwise, just install this mod after any other interface mod which affects fonts to ensure it's changes win out. 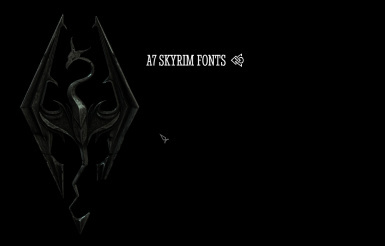 Fhaarkas, whose brilliant Skyrim Interface Mod included a heavily commented fontconfig.txt, which helped me out a lot and which I've unabashedly stolen and improved on.